In a series of exquisite close readings of Arabic and Arab Jewish writing, Jeffrey Sacks considers the relation of poetic statement to individual and collective loss, the dispossession of peoples and languages, and singular events of destruction in the nineteenth, twentieth, and twenty-first centuries. 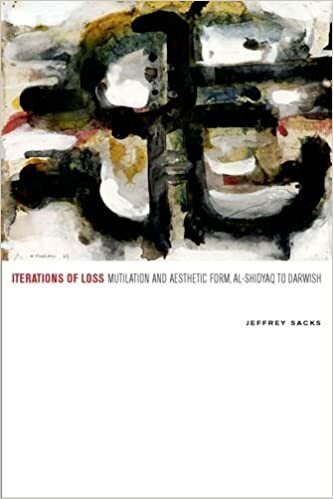 Addressing the work of Mahmoud Darwish, Ahmad Faris al-Shidyaq, Elias Khoury, Edmond Amran El Maleh, Shimon Ballas, and Taha Husayn, Sacks demonstrates the reiterated incursion of loss into the time of life-losses that language declines to mourn. Language occurs as the iteration of loss, confounding its domestication in the form of the monolingual state in the Arabic nineteenth century's fallout. Reading the late lyric poetry of the Palestinian poet Mahmoud Darwish in relation to the destruction of Palestine in 1948, Sacks reconsiders the nineteenth century Arabic nahda and its relation to colonialism, philology, and the European Enlightenment. He argues that this event is one of catastrophic loss, wherein the past suddenly appears as if it belonged to another time. Reading al-Shidyaq's al-Saq 'ala al-saq (1855) and the legacies to which it points in post-1948 writing in Arabic, Hebrew, and French, Sacks underlines a displacement and relocation of the Arabic word adab and its practice, offering a novel contribution to Arabic and Middle East Studies, critical theory, poetics, aesthetics, and comparative literature. Drawing on writings of Jacques Derrida, Walter Benjamin, Avital Ronell, Judith Butler, Theodor Adorno, and Edward W. Said, Iterations of Loss shows that language interrupts its pacification as an event of aesthetic coherency, to suggest that literary comparison does not privilege a renewed giving of sense but gives place to a new sense of relation.